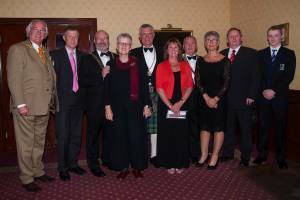 Cowdenbeath Rotary Club celebrates its 90th birthday. Rotary Club of Cowdenbeath - welcome! Please scroll/swipe down through this page to find out more about us, in addition to the pages linked in the menu, top-left. The Rotary Club of Cowdenbeath meets every 2 weeks in Wee Jimmie's, High Street, Cowdenbeath. Visitors are very welcome but please phone Secretary Tom Taylor on 07801 192970 in advance to confirm your attendance. We are delighted to welcome you to our club website. Founded in 1923, the Club serves the former mining communities of Cowdenbeath, Kelty, Lochgelly, Ballingry and Cardenden. Few visible signs of the area's mining heritage remain apart from the winding gear of the Mary Pit in Lochore Meadows Country Park. The area's former dependence on coal mining is perhaps reflected in the occupations of the Founding President - Charles C Reid, Chairman of Fife Coal Company - and Founding Secretary - Henry Rule, Manager of Kelty Gas Company. We meet fortnightly on Thursdays 6:00pm for 6:30pm in Wee Jimmie's Bar on Cowdenbeath High Street. Visitors are assured a warm welcome when you join us for lunch. Since our meetings are on a fortnightly rota please check in our Calendar for meeting dates. As one of the 86 Club in Rotary District 1010 - North Scotland, we are actively involved in local, regional and international projects. We offer organisations physical and financial assistance - whichever is most needed and deemed appropriate. In many occasions we will offer both if we can. Our members are committed to our local area and help and support many groups and organisations in our own community. As a club we hope to use our skills and expertise to make a difference in our community by being TRUE in all that we do; being FAIR to everyone we deal with; offering GOODWILL and FRIENDSHIP and making sure that our actions are BENEFICIAL for everyone involved. Thanks for taking time to look at our site, why not click on some of the links on the left and find out more about our club.